After two years of intense work, the Green Play project, a European project based on the “Juga Verd Play” competition model of the Baix Llobregat region in Catalunya (Spain) has come to an end last week. Initiated at the beginning of 2017, the Green Play project is now ending. 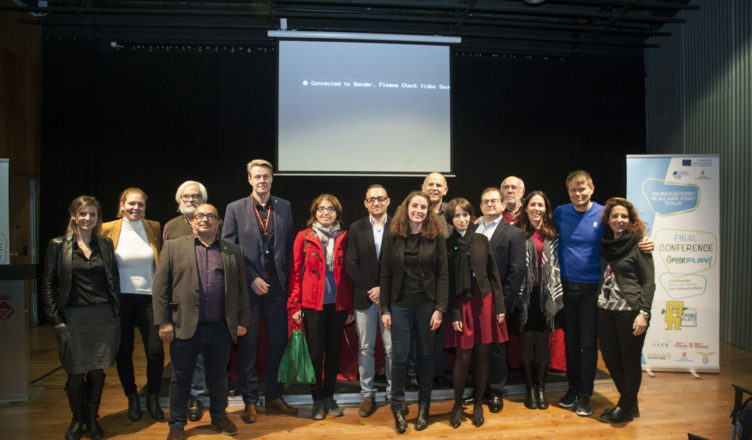 The final conference has been organized on the 22nd of November 2018 in the Nuria Espert Theatre of Sant Andreu de la Barca (Catalunya) and brought together representatives of the European institutions, regional and local authorities, sport organizations, associations and, of course, the Green Play project’s partners. It has been the opportunity for them to present the outcomes of the project, whether they were in charge of implementing the project in their organization, assessing the outcomes and making recommandations. Green Play project is co-funded by the Eramus+ programme and led by the council of the Baix Llobregat region in Catalunya. It is based on the successful “Juga Verd Play” methodology introduced in the Baix Llobregat region six years ago. The basic premise of the project is that if you want to educate in values, the goal of getting more points than the adversary cannot be the only condition to win the game; values and civic behavior also count. In this sense, another unique characteristic of the project is the integration of all the target groups (audience, families, referees and coaches) that participate in competitions in the assessing process, thanks to an app. For two years the methodology has been tested by the partners such as the Sporting Foundation, the Finnish sport federation of the Tampere region (HLU), the S.S Lazio club and the council of the Baix Llobregat region. The Italian Institute for social research has monitored the project’s steps and assessed the implementation of the programme whereas Sport and Citizenship Think tank collected similar good practices all over the world. To top it off, a 3×3 Basketball tournament has been organized after the final conference between 5 teams from Catalonian schools and teams form Sporting foundation, HLU and S.S Lazio, in application to the Green Play Methodology. The Finnish team got the most Green cards and then won the tournament by being the most fair-play team. The project has been an incredible opportunity to spread in Europe this alternative and innovative methodology which promotes fair-play and educational values and represents a radical departure from the current model of scoring system. The partnerships created through the Green Play project and the results of the project will set an important milestone in defending European values through sport and education. You can see the testimonial videos of the project on our channel Youtube.